In April 2103 my wife Carrie and I visited Barbados for the first time. A few months earlier we’d won the bidding for a week’s stay at a home in Barbados after remembering that Barbados is considered the birthplace of rum. It went without saying that we planned to visit every distillery on the island, but the story of St. Nicholas Abbey made it the obvious first stop. The Abbey has a long and storied history going back to 1658, which I won’t attempt to replicate here as it’s well documented elsewhere. What you need to know is that the Abbey was a fully functioning plantation and distillery, growing its own sugar and doing nearly everything else in-house. The owner’s mansion on the property is enormous, beautifully maintained, and would be worth a visit even if there wasn’t rum involved. At some point in the late 1900s you could visit the house as a heritage attraction, but the Abbey was no longer a functioning plantation after 1947. Things changed in 2006 when Larry Warren, a Barbados native and well-known architect specializing in historical preservation purchased St. Nicholas Abbey. In addition to setting out to carefully restore the buildings, he also set forth an ambitious project to make Abbey a fully functioning plantation and distillery like it had been hundreds of years earlier. Making rum is a time intensive process, primarily due to the length of time needed to age the rum in barrels. A three year aged is pretty much the minimum you’d want to do, and to compete with fine rums you’re talking 10+ years from harvesting the sugarcane to bottling the rum. Obviously this ties up a lot of capital for a number of years before you start earning back your investment. As such, Larry Warren did what lots of distillers do – He jump-started the process by purchasing existing stock from another distillery and continued aging it in barrels at the Abbey. 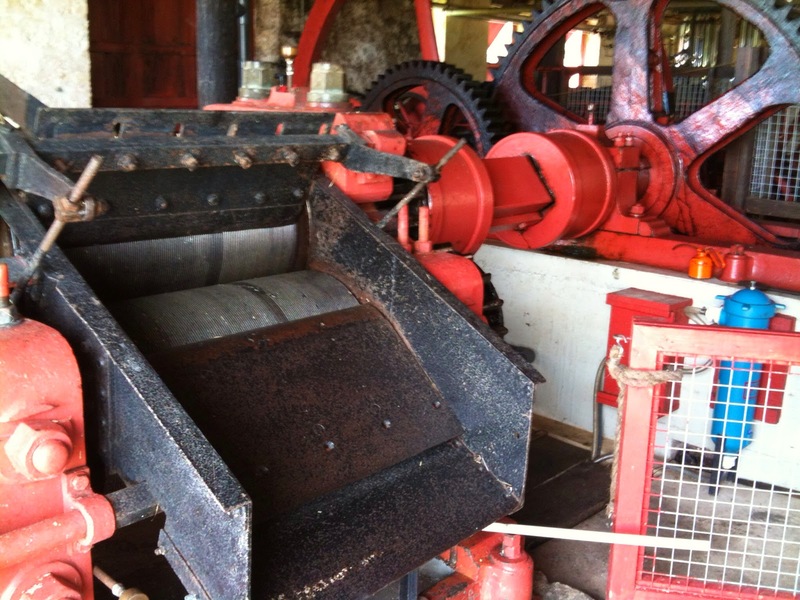 This lets the distillery blender start working with the barrels earlier, as well as provides an income stream once the rum is deemed ready to sell. In the case of St. Nicholas Abbey, Larry was lucky in that he purchased his starter rum from Richard Seale, owner of the Foursquare distillery in Barbados. The Foursquare distillery produces a number of highly regarded rums, including Doorly’s and more recently, the Real McCoy rum. Richard Seale is highly active in promoting quality rum, sharing his detailed expertise about the rum making process, and exposing companies that play games with their rums. Barrels purchased from Foursquare Distillery to help get St. Nicholas Abbey launched. Starting with the Foursquare originated rum while simultaneously starting their own sugar cane/distillation pipeline, the Abbey started selling aged rums around 2009. To date, they’ve sold Foursquare based rums at ages of 8, 10, 12 and 15 years. When we visited in 2013, they had stopped selling the 12 year, but had the 10 and 15 year available. In addition, they had an entirely in-house produced “white” rum aged for 3 years if I remember correctly. In addition to Larry, his sons Simon and Shae are also involved in running the business. Since Larry is still busy as an architect, Simon handles much of the day-to-day business, down to pouring rums in the tasting room. Simon was there they day of our visit and we had a lovely half-hour-plus chat with him. Simon and I went in to full rum-wonk mode, such that Carrie had to bail out and browse the gift shop. Chatting with Simon about rum making and the distillery history was one of the trip’s highlights. Simon Warren (L), and Cocktail Wonk (R) in the tasting room. Upon entering the St. Nicholas Abbey grounds, your first stop is the mansion. You can choose to take a guided tour if you’d like. Among the many curiosities in the mansion. Behind the mansion is a small cafe/garden. From there you hook a right and after a short walk find yourself at the small bottling house, which you’re allowed to enter and look around as the worker process bottles. It was still a very small operation, done mostly by hand. Punch for making the leather stopper insets. Continuing past the bottle house you’ll come to a barn-like structure that houses the Annabelle the copper hybrid pot/column still, aging barrels, and the sugar cane crusher. Annabelle, the hybrid pot/column still. After wandering through the barn and marveling at its contents you head out back to the remains of a stone windmill. Past the windmill are lovely fields of sugar cane. The windmill and barn housing the crusher, still, and aging barrels. Remains of the original windmill. Cocktail Wonk was very exited to be among his new cane friends. Another view of the barn and smokestack. You can wander around the rest of the beautiful Abbey grounds, lush with plant life and strewn with interesting artifacts. All sort of interesting sites on the Abbey grounds. As for the rum itself, I find the 10 and 15 very consistent with the other aged Foursquare rums, i.e. the classic Bajan style. The nose is fairly intense, in what I can only describe as “high octane” in a very nice way, and very different from Jamaican rums. The taste is dry, as it has no added sugar, but very smooth and little burn. It’s a very different experience than something like Zacapa XO or El Dorado 15. Once you start sipping the St. Nicholas Abbey you’ll find it hard to stop. The St. Nicholas Abbey bottles for their aged rums are works of art. Each is etched with a picture of the mansion, and you can have it personally engraved if you wish. The bottle stoppers are made from mahogany wood grown on the plantation, and have a circular inset of embossed leather. Aged rum bottles showing the etched image of the mansion. The cost for the Abbey’s rums is a bit expensive with the 15 year costing US $130 and the 10 year costing US $80. However, having seen the history, attention to detail, and realizing all the labor involved, we happily snapped up four bottles – two for my collection, and two more for friends back home who had put in requests. We’d have bought more, but needed to save room in our suitcase for other Barbados rum treasures. As a bonus for being a repeat customer, if you bring your original bottle back, they’ll refill it for half price, something I aspire to do some day. Next Next post: Was the English Civil war responsible for the birth of rum?